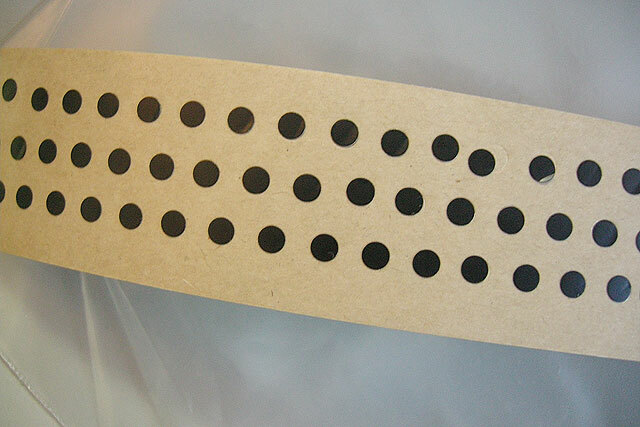 One thing I noticed when I got my package of Analogue Renaissance Juno 106 Cone chips were the rather long protruding Side pins on one side of the chip. I remember somewhere on another forum that a user questioned the same thing about the chip. He mentioned he simply trimmed the side pins in order to make room for them to fit in his Juno 106, but he to was worried whether that was appropriate or not. I found I had the same question. 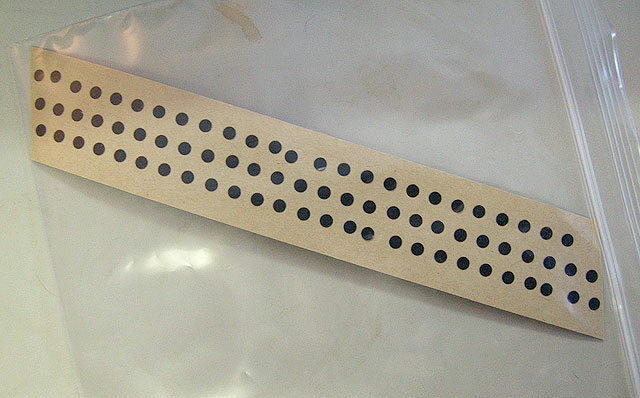 The Voice Chip does fit tightly, but there are some elements on the side that can rub or lean against the chip. Perhaps it is common knowledge among electronics experts whether this has any negative impact on installation or performance, but my wonderment was why they would be so long when it’s common knowledge the slots are narrow and a rather tight fit. Here’s a photo of what I am talking about below. There is just enough space after careful bending of the elements to the left and slight slanting of the chip to the right. Again I’m baffled as to why those pins are left so long. I understand the leg pins on the chip are usually left long for insertion and clearance, but on the side I have no idea. Nonetheless, the gentleman on the other forum in fact trimmed the side pins and after installation everything worked just fine. I’ll post a reference link to that forum once I find it again. Thanks! 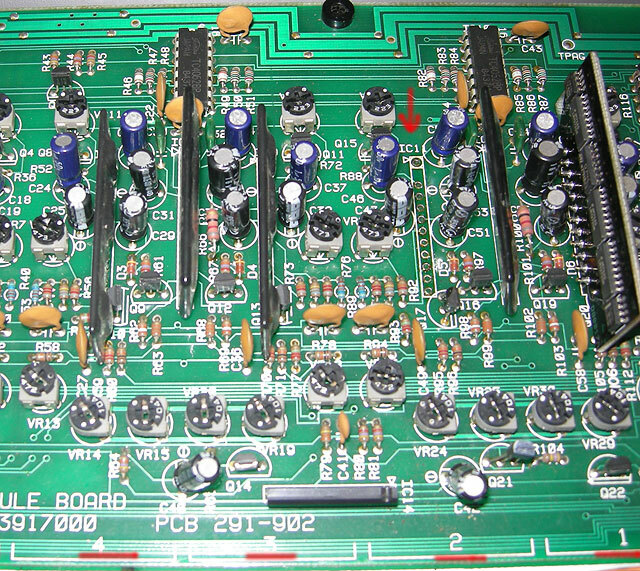 In the photo below you can see a shot of my Roland Juno 106 board that I took not too long ago. I took this to illustrate that you can silence the snap, crackle, and pop noise that failing or dying 80017A Chips make. These were desoldered using a Vacuum Pump device and some Desoldering Wire, however, ultimately they were eventually yank out (nicely I must add) and then the holes cleaned up nicely. 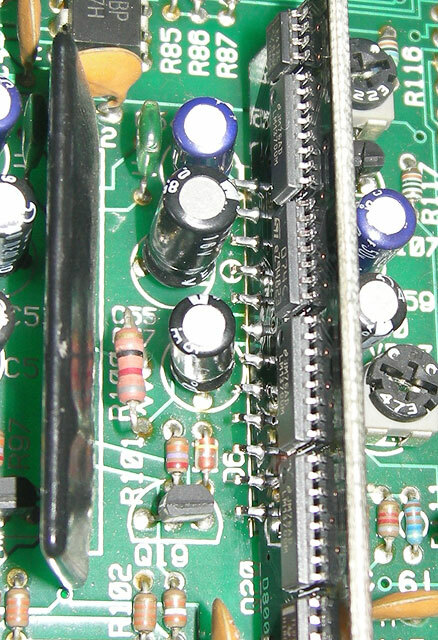 Once the board was placed back into the Roland Juno 106, there was a nice silence form the removed chip. I could then proceed with playing in either Unison mode or just with the few voices I had left. The Juno 106 sounded awesome. Note that you still get a faint noise from the Chorus effect which is common with all Roland Juno 106’s I believe. 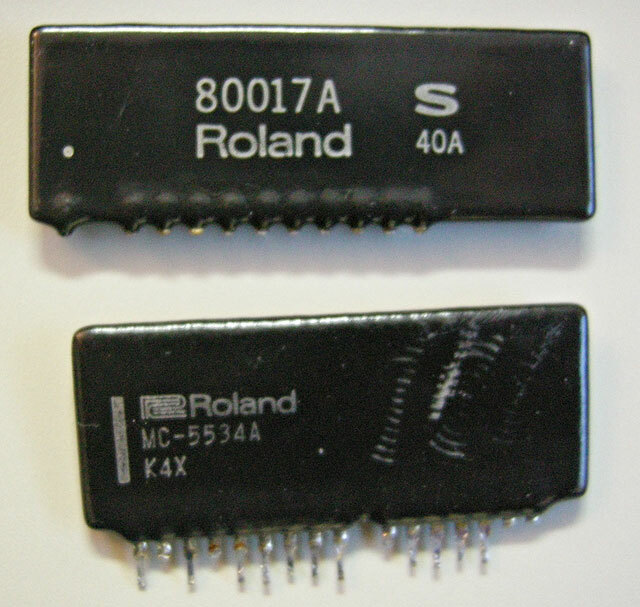 You will also notice that I still have two of the original Roland 80017A chips in the #3 and #4 slots. They work perfectly and are currently the only two chips that work on the board. The MC-5534A Filter Chip is still working fine in the middle of #3 and #4 Voice chips respectively. To the right you will also see a brand newly purchased Analogue Renaissance Juno 106 cloned Voice Chip installed, however, this chip is does NOT work. It’s disappointing, however, I am still looking into the matter. The chip is soldered nicely and as you can see next to it on the left is the MC-5534A Filter Chip original still intact and of course the pulled #2 80017A Voice Chip that went bad. I have yet to put in a second chip as of this writing for fear or it not working as well. 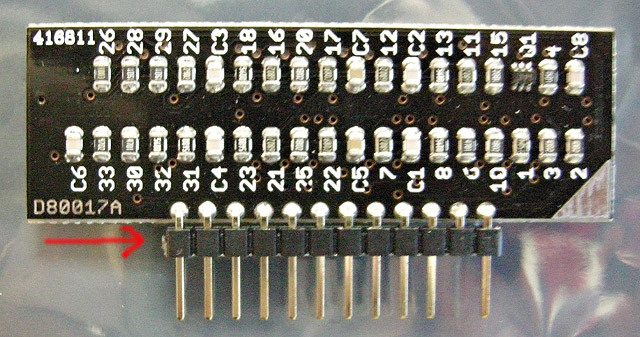 I’m trying to determine if the new Analogue Renaissance chips are good and why they are not working when appropriately soldered into the board. In Conclusion, you can most certainly play your Roland Juno 106 Synthesizer with pulled or missing Voice Chips. 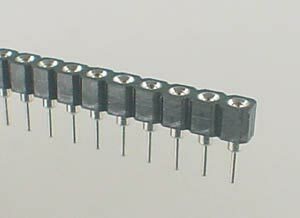 It will eliminate the Snap, Crackle, Hissing, and any other Noise these failing 80017A chips can create. A trick to playing the Synth without the chips is to hold down the number of voices that play on the keyboard ( in my case 2 ), and then tape down the remaining silent voices to the far right or left of the keys ( in my case 4 dead voices ). You can then release the working voices and play anywhere on the keyboard no problem, but of course the Juno becomes a 2 polyphonic Synthesizer. You can also still play in Unison Mode which works nice too, but it does give you a different tone that some like and dislike. 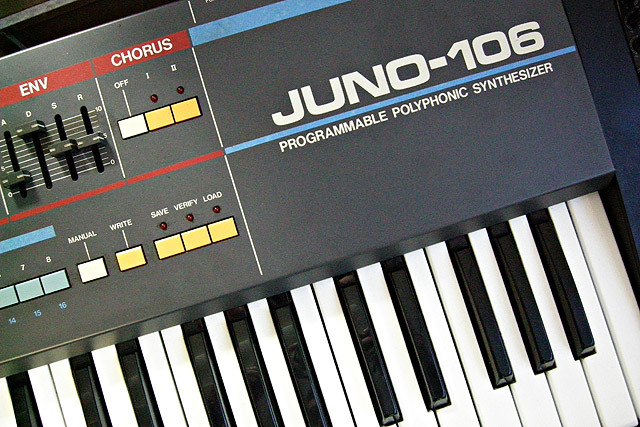 Either way, you can salvage the Roland Juno 106 and play bass lines or make it a mono Synth. Stay tuned for more updates. Thanks!